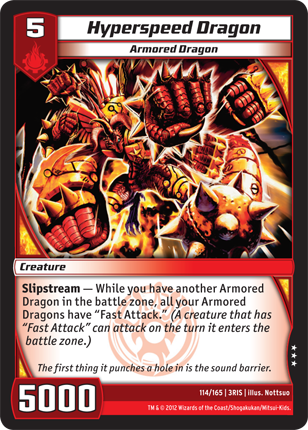 You are here: Home / Kaijudo Article Contest: The Rise (and Evolution) of the Duel Masters! Hello everyone! I am glad to write once again for Alter Reality Games! For those of you who do not know me, my name is Connor Bazil. I’ve written here once for the YuGiOh Holiday Contest back in 2011. Currently, I play a variety of card games such as YuGiOh, Kaijudo and even a little MTG. Over the past few months, Kaijudo has instantly become one of my favorite games (probably because I enjoyed Duel Masters so much :D). I was delighted to hear about the recent Organized Play announcement and cannot wait to hear more news about it! In this article I will discuss how to game has evolved into what it is and what will hopefully be seen in the near future. I first heard about Kaijudo last summer from my friend (and common ARG writer) Paul Clarke. He told me Duel Masters was coming back under a new name. I was delighted of this news and instantly jumped on the game. The game was almost exactly the same and I was glad to play it once again. Paul ended up quitting after a few months and I continued and was able to get a couple of friends to start as well. Although there isn’t a lot of competition, it is still fun to play with these few friends. So how far has the game come? The most recent set being Evo-Fury and Dragonstrike Infernus hitting shelves in only a matter of weeks is astonishing! To think the game is on its fourth set and is about to enter the fifth. A recent video posted by EarthP0w3r stated that the one year anniversary of the game’s announcement release was this week. Kaijudo has been known for a year now and the player base is slowly growing on a regular basis. The game’s evolution is increasing and will hopefully never end! In the most recent set, Evolutions hit the table with the next set containing a lot of Dragon support (possibly bringing back Hyperspeed Dragon decks). Commonly seen decks mostly involve Blurple and commonly a deck using Water and Darkness. It seems many decks with these two civilizations perform well with the amounts of discard, draw and destruction in those two colors. Nature and Fire have been slowly gaining more play with their abilities to spam big monsters and gain mana, while Light seems to trail along doing alright but is not as commonly outweighing other colors. Although Cobalt WDL and Orion Control are relevant, I rarely see them in action or hear about them rampaging tourneys. FN Hyperspeed was my favorite deck before Evo-Fury but by the time I finished the deck it seemed much worse in comparison to other decks. What is good though is that although this is the current Meta, there is room for innovation. There are lots of cards for every civilization, and any deck has potential to do well with the right cards and a smooth flow of synergy. Over the past couple months, I have been keeping up to date with YouTubers CVH and EarthP0w3r (among several others) to gain a better understanding of the current Meta. Coming from a local with a minimal amount of players (3-4 including myself) makes it difficult to have a strong idea of what the best decks really are. It is disappointing to see how little the New Hampshire player base has improved since its release. But amidst the lack of commitment, the few of us who are dedicated to see this game go far have and still make the relentless effort to inspire more players. A few days ago, I also began playing on OCTGN. This was a new experience and was easy for me to adapt to, and it did open up to me how different the Meta really was. I played against Blurple and WNF and both of them rocked me! Emperor Neuron is too good and so are cards like Flamespike Tatsurion and Hydra Medusa. These Evolution creatures are so powerful in comparison to anything else in their level range. I’ve been working with Cobalt WDL and it works alright, but early game Neuron is quite difficult for me to overcome. I always pray for that Bone Blades or Terror Pit shield trigger but they were never there. I almost want to take out Water and put in Nature just to have a little extra removal and mana vamp. The Kaijudo page on Facebook called the Kaijudo Dojo hosts Skype tournaments occasionally, and I plan on attending this Friday through the following week. OCTGN and Skype tournaments are opening up new possibilities for avid players with little to no competition in their area. It also gives an idea of how Meta may work in action instead of watching videos about it or reading it in an article. Playing with people on a national level is helpful since you are playing with other people throughout the United States who may have a different understanding that can help inspire or strengthen a player’s thought process. The game is expanding quickly, and we need to get the jump on it. With Master Challenges coming up, players such as myself need to playtest a variety of decks and play with a variety of people. OCTGN is my current method of testing since only a couple people at my store are playing at the moment and only one of them plays a competitive deck (Blurple). Although it is good testing, it is only one deck I am playing against and he also uses proxies for cards like Emperor Neuron and Screeching Scaradorable. This isn’t getting people to buy the product or really get into it and I don’t have a large range of testing against other decks. What I hope to see (either by Wizards of the Coast or ARG) is active coverage on events. Similar to YuGiOh back in the day, Metagame used to cover Shonen Jump Championships where all competitive players would enjoy reading and learning. Some friend and I have concluded that having matches recorded (either by video or an article fashion) is a great way to learn more about the game. Knowing what decks are doing well over others and how the Meta changes from event to event also gives appeal to players (not supporting net decking but it is good to know what decks are the best). With a solid amount of coverage and articles, this game could become larger and more competitive. It is hard to believe that the routine I go through for a YCS is soon going to become the Kaijudo Master Challenge preparation. The game has quickly evolved into a competitive and fun game for all ages. With further advancement and involvement from Wizards of the Coast, this game could easily be widely popular and surpass its predecessor (Duel Masters) in sales and player activity. The game is much more balanced than any other game I have been involved in and continues to amaze me. So in conclusion, the game has developed into a strong and competitive game with future evolution to come. The players and WotC have all worked hard to turn the game into the game we know and love. I can't wait to see further updates on the game's progression. 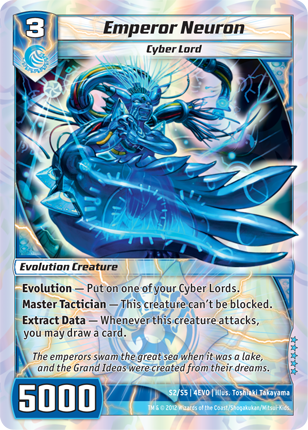 So that is all everyone, hope you enjoyed my article and if you don't already play Kaijudo, stop by your local card shop and pick up a Demo deck! Until we meet again everyone! Hello everyone, I am Connor Bazil. I play competitive YuGiOh in the north-east of the United States. Sadly, I do not have much to say about my achievements in the game besides going to Nationals twice, and one YCS in Providence. I hace received a large amount of knowledge since I started playing in 2007 with the release of Gladiator's Asssault. SO I am creating this account to share my opinions and information on the game so other players can learn and give feedback from my posts and articles. Double Trigger: Luck or Logic?